Over the past few years, Microsoft has tried to help us resolve our internal organizational struggles over Tracked Changes by offering different default flavors, features and fail safe plans. When you turn the Track Changes feature on, and depending on the settings in the Display for Review field and what is checked on the Show Markup dropdown menu as you make changes, you will see the mark up notation. For example, a deleted word shows up with a line through it in a different color, followed by the word to replace it. This distracts many people so they turn it off, defeating the intention of the document owner to have the choice to accept or reject an edit and see one person’s changes separate from another person’s changes. Microsoft has given us several features to help us keep track of changes without ruffling any feathers since the older versions first came out. By clicking Show Markup, Reviewers, followed by unchecking All, and checking no other authors, you will effectively make Tracked Changes invisible. They’re still being tracked, and you can reverse this process to see all the markups at whatever is set in the Display for Review field. Final, of course, will show you what your document looks like with all changes applied. Original shows you the document before any edits were made. Where it can get a little confusing is the difference between Final Show Markup (Showing Markup in 2007) and Original Show Markup. There isn’t much difference. Where you see the difference is in any formatting changes that were made. 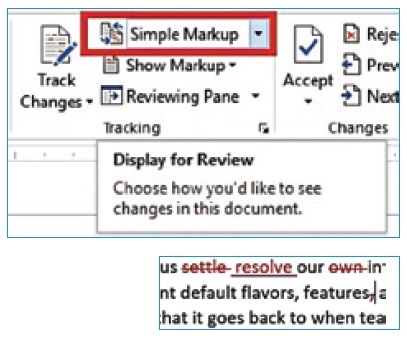 For example: If you bold text in a revision with Original Show Markup selected, you will see the text unbolded with a balloon to the right telling you about the format change to bold. In Final Show Markup, you’ll see the same balloon, but the text will be bolded. When you are the document owner, it may be best to have your reviewers work in Final mode. They won’t be distracted by the markup on the screen and thus won’t be tempted to turn it off. In 2013/2016, the default mode is Simple Markup. In this mode, the changes are made and tracked, but no markup is seen. When people look on the left side of the page, they will see a red line drawn next to any paragraph where changes were made. This is sort of a compromise: no messy markup but still an indication that changes were made. The newer versions also have the ability to Accept All Changes and Stop Tracking. Just click on the Accept button. A new feature in 2016 can make it more difficult for someone to turn off Tracked Changes if you didn’t authorize it. Under the Track Changes button, you’ll see a Lock Tracking feature, which enables you to set a password.